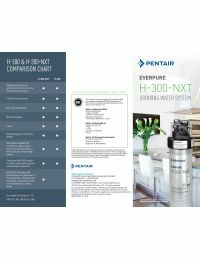 The Everpure H-300-NXT Replacement Filter Cartridge EV927441 offers commercial grade filtration for your home or business. This is the first filter of its kind to be NSF certified for pharmaceutical reduction that can be found in your drinking water supply. The EV927441 is designed to reduce pharmaceuticals, over-the-counter medications, herbicides, pesticides and other chemicals used in manufacturing like BPA. 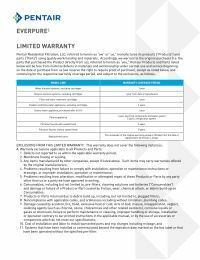 Everpure features an exclusive precoat filtration technology which combines Micro-Pure technology with a unique filter membrane that is 30% larger than the H-300 filter. Reduces Chlorine Taste and Odor. The taste of chlorine in water can be traced back to water treatment plants. 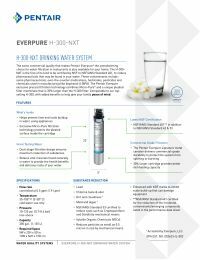 The H-300-NXT filter reduces the smell and taste of chlorine and other offensive contaminants that can adversely affect the taste of water and beverages. Unique Certifications. The H-300-NXT filter featured certification is by NSF to meet the NSF/ANSI Standard 401. This certification shows that this filter eliminates 15 emerging contaminants that maybe harmful to your family. Pharmaceutical Reduction. All types of medication can end up in our drinking supply. Drugs like antibotics, hormones, and even mood stabilizers have been found throughout the United States. The H-300-NXT will give your family peace of mind knowing they are drinking safe and healthy water. 30% Larger Cartridge Capacity. This filter features a unique pleated membrane that will provide a larger dirt-holding capacity. The H-300-NXT helps prevent lime and scale build-up in water using appliances. Popular reFresh Product Click Here to learn more about our reFresh program, and how you can get all your filtration product auto-shipped! NSF Certified This Filter has been tested & certified against NSF/ANSI Standard 42, 53, and 401 for reduction claims. WQA Gold Seal The WQA Gold Seal ensures that this product is constructed of safe materials, and reduction claims are tested.